A new report titled Red Water documents the social, environmental, economic, and health impacts of gold mining in Porgera, Papua New Guinea. The report finds that the communities affected by mining do not have access to consistent and safe drinking water. This is due, in part, to the fact that the PNG government has not met its human rights obligations to respect, protect, and fulfill the right to water in Porgera, and because companies that own and operate the mine—Canadian company Barrick Gold and Zijin Mining from China—are in breach of their responsibilities to respect the right to water. Red Water finds that the Porgera Joint Venture (PJV) gold mine poses direct threats to the social and economic rights of communities living near the mine. These key findings are a result of a four-year study conducted by Earth Institute scientists, Pennsylvania State University scientists, and Columbia Law School Human Rights Clinic faculty and students. The investigation conducted over 177 interviews and meetings and collected and analyzed 45 sediment samples from streams adjacent to the PJV gold mine, 25 soil samples from local residents' household gardens, and water samples from 64 sites. The PJV releases mine waste, known as tailings, from the mine facility into the Pongema River at an average rate of over 14,000 tons per day. The tailings discharge forms what local residents refer to as the "Red River." 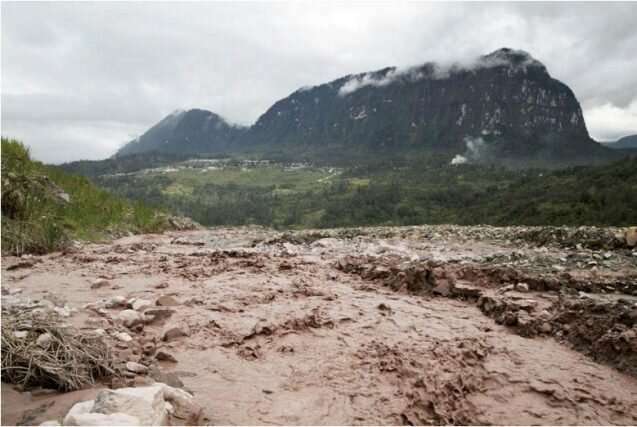 A 2013 study noted the catastrophic environmental consequences of tailings discharge and noted that of the 2,500 industrial-sized mines in the world, only four mines—three of them in PNG—were found to rely on riverine tailings disposal. According to one resident of Porgera, the local residents are "in a desperate situation. [Our] environment is not in a good condition." Moreover, with a changing climate, water insecurity in the area is an acute problem. The Porgera gold mine has been one of the world's highest-producing gold mines over the course of its quarter-century history, and has accounted for a considerable percentage of PNG's economic income. The mine, which began operations in 1989, has long been contentious, and has generated global attention for both violence by security personnel and allegations of environmental degradation. The mine is owned by the PJV with a 95 percent share held by the mining companies.